Where Did the Term Stakeholder Come From? In September of 2006, Deputy Secretary of State Robert Zoelick used the word “stakeholder” when speaking about US/China relations. The Chinese language does not have a corollary word for “stakeholder” and the use of the word led to quite a fuss. The State Department suggested a Chinese phrase meaning “participants with related interests”. The term stakeholder had come into common useage by the end of the last century, but where did the word come from? One possible source is the person who holds the money or stakes in a bet. Another possibility is in mining prospecting where you drive stakes into the fours corners of the property you want to claim. Stakeholders are people inside and outside an organization who have a vested interest in a problem and its solution. They can be both positive and negative in their interests. Wikipedia, the free online encyclopedia, has a good section on the term. In all current project planning a stakeholder analysis is a vital step. But where did the common modern useage of people in “interest groups” come from? There are many ways to classify or categorize stakeholders. One way is by evaluating their Interest, their Attitude, and their Power. 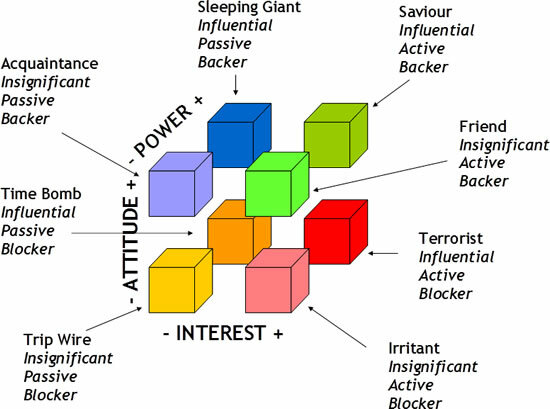 Study the following “stakeholder cube” diagram from Lucid Consulting in the UK. It is an excellent categorization of various types of stakeholders. Robert (Bob) Youker is an independent trainer and consultant in Project Management with more than forty years of experience in the field. He is retired from the World Bank where he developed and presented six-week project management training courses for the managers of major projects in many different countries. He served as the technical author for the bank on the Instructors Resource Kit on CD ROM for a five week training course on Managing the Implementation of Development Projects. Bob has written and presented papers at many Project Management Institute and International Project Management Association (IPMA) conferences over the years, many of which have been reprinted in both organizations’ publications. Mr. Youker is a graduate of Colgate University and the Harvard Business School, and studied for a doctorate in behavioral science at George Washington University. His project management experience includes new product development at Xerox Corporation and project management consulting for many companies as President of Planalog Management Systems from 1968 to 1975. This entry was posted in ChangeAgent Posts and tagged Stakeholder on January 7, 2012 by Stacy.